Good ol' Southeastern deserves a thread of it's own I thought. Speaking of short train formations, Southeastern very recently started to introduce some 12 car services. Some on the Sidcup Line and some on the North Kent Line but none on the Bexleyheath line, which is according to their statistics the busiest out of the three! It seems Southeastern have listened overnight to my complaint about there being no 12 car services on the BEXLEYHEATH Line. Well I am currently on the 9:38 Barnehurst-London Cannon Street and it's formed of 12 carrages!!! That's the first 12 coach train to my knowledge to run on the line! The second bit of news is that I have just passed a two train 375/3 set at Lewisham Flyover running 'EMPTY TO DEPOT'. Well the rear train 375307 looked to be very newly refurbished with light blue/lilac doors and the previous grey stripe has now made way for an all over white paint job. Safe to say that the refurbishment of the 375 has now commenced! They don't have enough stock to make more services as 12 car without making others shorter. There are still a number of 4-6 car services in the peak, some mentioned here, and there are probably others too. ShamblesEastern (Cannon Street) aren't having the best of days. A train stuck between Cannon Street and London Bridge (from what I could see, a fairly long and busy train with lots of angry faces peering out, with the last part of the last carriage still at the end of platform 5) is causing cancellations and delays. My Dartford (via Woolwich) train is twenty minutes late but that's not what annoys me. What annoys me is that a NON air-conditioned train (class 376) can have some of it's very few openable windows, locked shut!!! It's boiling and nothing we can do about it! I suspect the issue of train ventilation during delays / incidents will come to the fore given what happened to people on trains for hours as a result of the damaged conductor rail just south of Clapham Junction. Clearly with no power the air con will struggle to work and with rush hour loadings the interior temperature would rocket. Obviously not quite the same situation for you but a non moving train that's reliant on movement to create ventilation will also heat up. Had an onboard ticket inspector on my Cannon Street-bound train today (boarded at Falconwood). This is a first for me; usually if there are ticket inspectors, they will wait by the station exit, waiting to pounce on unwilling commuters. Going back to this post I very much doubt that's the first ever 12 car train to run on the Bexleyheath Line. Up all the way through the 1990's and probably up until the end of slam-door mainline services there was a Kent coast (I think it started as portions from Ramsgate and Dover) to London mainline service that was always scheduled up the Bexleyheath line and usually passed Barnehurst, non-stop obviously at about 08:15 every Mon to fri morning, which was always 12 car CIG,CEP,VEP formation (or combination of). I'm not sure of the reasoning behind sending a mainline train up the Bx commuter route but it could have been just down to an available gap the timetable or something to do with the regular slam door stock that stabled at Slade Green depot every day between the peaks. Due to a second (!!!) landslide, the Bexleyheath line will be closed for today. 3rd day in a row. Oh Dear Poor 89's again. 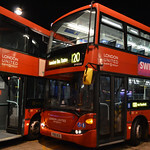 Is there any extra 89's out alongside the standard service - surely that's the best way to stop the route from going down the drain? I think I read somewhere that the class 365s are due to be replaced within the coming years. When/if that happens, I wouldn't be surprised if some end up on the Southeastern Railway again. Some of the class 365s from Great Northern are earmarked for GWR. Do they still have their 3rd rail shoe gear? Shoe gear was removed from the units that did have it when Connex handed them over to WAGN. Shouldn't be difficult to refit the shoe gear. I'd imagine they keep stuff like that in storage. 21 of the 365's are earmarked for the GWR, the remaining 19 are unaccounted for. The 365's are DV units, so yes it wouldn't be too difficult in refitting and removing shoes as seen on London Midland's Class 350/1 whilst on temporary loan covering WLL duties a few years back. I believe Woolwich Dockyard is the trouble maker on the Greenwich line when it comes to preventing 12 car workings.